The Mounted Enforcement Unit (MEU), established in 1978, is one of the premiere units of its kind in the state of California. Team members work this assignment as a collateral duty. Some of the Team members are State Mounted Officer instructors and teach throughout the state of California. All of the horses are privately owned and most of the members ride their own horses. The MEU has been utilized in a variety of functions, such as large crowd management at the Democratic National Convention and the 1984 Olympics, area gang enforcement, anti-burglary patrols, Fourth of July celebrations both in our contract cities and on the beaches, the annual Ventura County Fair, back country trail patrols, marijuana eradication patrols, and a variety of public and school relations details. The unit also has a Mounted Color Guard, which presents the colors at formal events and performs a riderless horse ceremony for a fallen officer’s funeral. In addition, the MEU works closely with our non-sworn citizen posse. The posse rides side by side with the MEU during training days and assists with certain types of MEU callouts, and also assists with a number of civic events. 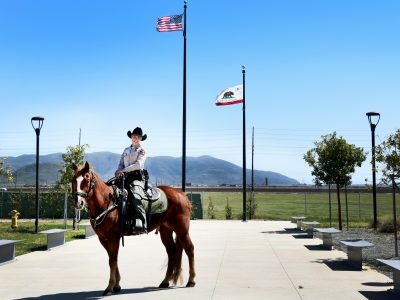 The success of the MEU is directly attributable to the many dedicated personnel who make up the unit, and their commitment to mounted law enforcement that characterizes the Ventura County Mounted Enforcement Unit.